A former regional daily chief reporter who fought a ten-year battle against cancer has died aged 51. Julie Harding spent more than 20 years with the Bristol Evening Post in two separate stints with the newspaper. She was diagnosed with cancer ten years ago and despite undergoing a series of operations continued to work until 18 months ago. Bristol South MP and former Treasury minister Dawn Primarolo was among those who joined in the tributes yesterday after news of her death was carried in the newspaper. Post editor Mike Norton, who described Julie as ‘irreplacable’ when she bowed out of the paper in September 2010, said: “Everyone at the Post was extremely sad to hear of Julie’s death. “She was an excellent journalist who cared passionately about the people and the issues she wrote about. “She also had the rare gift of being able to connect with the young people who worked with her, offering them advice and encouragement. Julie first came to Bristol from Bedford in 1980 and worked for weekly title the Observer as a trainee reporter. She joined the Evening Post two years later, returning to work on the Observer after the birth of her daughter, Tegolin. In 1991, she rejoined the Evening Post full-time and within a year was made crime reporter, remaining in the role for nine years. She eventually became chief reporter and continued in the post for the remainder of her career. Throughout her time with the Post, Julie earned a reputation as a passionate and committed campaigning journalist. An expose into pimps who encouraged young girls to become prostitutes at a children’s home led to its closure and the introduction of new care procedures by the city council. Julie was also at the forefront of the Post’s campaign to try to save the Cadbury factory at Keynsham. It was her idea to confront the Cadbury directors at a top London restaurant when they went for a meal shortly after the closure was announced. Deputy editor Rob Stokes said: “She was a true friend and advocate for those who needed help and a fierce and tenacious opponent for those who she exposed for doing wrong. “When people spoke of her they accompanied her name with words such as warm-hearted, fearless, fair and a consummate professional. “But above all they used the words honesty and integrity. She brought the same standards to everything she wrote, whether it was a major crime story or the opening of a playgroup. 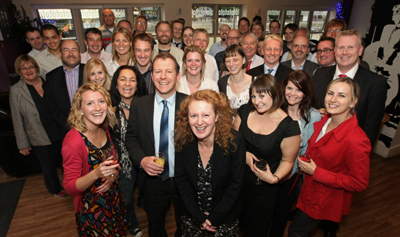 Ms Primarolo added: “Julie was a fantastic reporter, whose work was highly regarded in Bristol and beyond. “She was a talented journalist who worked tirelessly to find and develop stories. Above all, she was scrupulously decent and honest. “She would never shy away from asking tough questions, but I always answered them in the knowledge that my responses would be accurately and fairly reported. I didn’t know Julie but she sounds like the type of reporter this country needs more than ever. I was Julie’s news editor on the Post for many years and she was a dream to work with. Whether she was laying down the law with the police as crime reporter or helping young colleagues as chief reporter, she always made her mark. Miss you Jules. Found out yesterday. Julie’s deathj is very upsetting to all the people who knew her. Julie was passionate about her job and idolised her daughter. It was my pleasure to have shared a newsroom with her for nearly five years.